A hacker defaced the website of EC-Council, an organization that runs IT security training and certification programs, and claims to have obtained copies of passports of law enforcement and military officials who signed up for the organization's courses. Based in Albuquerque, New Mexico, the International Council of E-Commerce Consultants (EC-Council) runs several certification programs including Certified Ethical Hacker (CEH), Computer Hacking Forensics Investigator (CHFI) and EC-Council Certified Security Analyst (ECSA)/License Penetration Tester (LPT). The organization claims to have trained over 80,000 individuals and certified more than 30,000 security professionals from organizations like the US Army, the FBI, Microsoft, IBM and the United Nations. It also claims to have received endorsements from various U.S. government agencies including the National Security Agency (NSA) and the Committee on National Security Systems (CNSS). Over the weekend, a hacker who calls himself Eugene Belford -- most likely after a character in the movie Hackers -- replaced the homepage of the www.eccouncil.org website with several messages and a screen shot of an email application for admission to the CEH program sent to the organization in 2010 by former NSA contractor Edward Snowden. The page contains a photocopy of Snowden's passport and a letter from a Department of Defense Special Representative in Japan acknowledging Snowden's five-year experience in information security. Both documents were allegedly attached to the 2010 email in support of Snowden's CEH application. 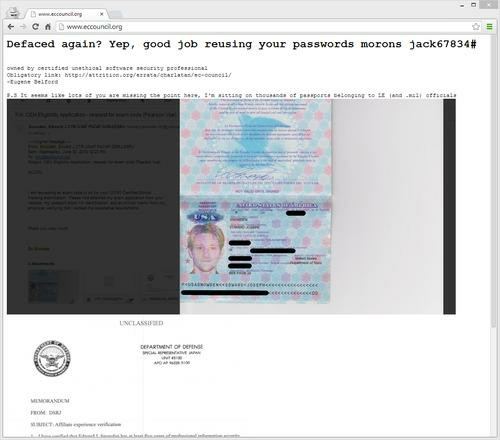 "I'm sitting on thousands of passports belonging to LE [law enforcement] (and .mil) officials," the hacker wrote on the defaced EC-Council website. Another message suggests that this was the second time the site was defaced and that EC-Council reused passwords while attempting to recover from the first defacement. It appears the attack was the result of DNS hijacking with the domain name pointed to an Internet Protocol (IP) address under the attacker's control. This also seems to have affected EC-Council's email infrastructure, as attempts to contact the organization at two of its publicly listed email addresses failed with a DNS error. EC-Council could not immediately be reached for a request for comment.